Registration is open for 2019! Registering online gives you immediate access to scheduling classes. View a sample highlights video, select highlights and view the Discovery Now 2013 Video. Summer enrichment courses at Wright State University are designed to stimulate your child’s creativity and enthusiasm for learning. Pre-College Programs is pleased to offer summer enrichment for students entering grades K-9. Students who desire challenge; are interested in learning and personal growth; and have the motivation to succeed are encouraged to take advantage of these hands-on, exploratory courses. Educators and professionals from the Miami Valley provide a stimulating and challenging learning environment that encourages creativity and critical thinking. All courses are held on the main campus of Wright State University. Each course has a limited enrollment of 17 students. Many courses fill quickly; early registration is encouraged to secure your first choice sessions. It is highly recommended that you indicate an alternate course in the event that your first choice is full or cancelled. Your student will automatically be placed into the alternative course providing it is available. Please remember that children need to wear appropriate clothing for hands-on activities. The fee for each session is $130. A registration deposit of $65 per session is due with each application. The registration deposit is NON-REFUNDABLE after acceptance into the selected course. The balance due ($65 per session plus any extended care fees if applicable) must be paid in full two weeks prior to the start of the session. Any payments made after the balance due date will be charged a $10 late fee. All late fees must be paid in the Office of Pre-College Programs. Pre-College Programs reserves the right to cancel any registrations if payments are not made by the given due date. After May 1st a fee of $10 per course will be charged to change a course selection once a student is officially enrolled into the program. Some courses require specialized lab equipment and materials. These courses will be charged an additional $20 lab fee. If a course has a lab fee, it will be noted in the course description. The registration deposit of $65 per session is NON-REFUNDABLE after acceptance into a selected course. All requests for refunds due to cancellation must be submitted in writing. A fee of $30 will be deducted from refunds requested after May 1st. In the event that a course is cancelled due to insufficient enrollment, a full refund will be issued. Refunds will not be issued for students dismissed for disciplinary reasons. Upon acceptance, you will receive an e-mail confirmation of your student's registration. General program information will be included with the confirmation. Students with disabilities may request reasonable accommodations for any of the Discovery/Odyssey camps. The student to teacher ratio is 17:1; students must be able to take responsibility for their own behavior, are expected to work independently in the classrooms, to be independently mobile on campus, and able to provide for their own eating/toileting needs. Should a child need a higher level of assistance, they may bring a preapproved aide with them. Students have the opportunity to swim twice a week, the pool is equipped with a lift that the aide may use with the student. Materials in alternative format are available. Accommodations must be requested minimally two weeks prior to the camp by emailing precollege@wright.edu. No classes will be held on Thursday, July 4, 2019. All fees will remain the same for this week. Extended Care is available for parents who need to drop off and/or pickup students before or after normal program hours of 9:00 a.m.- 3:30 p.m. Parents who take advantage of the Extended Care option may drop off their student(s) between 7:30-8:00 a.m. All students must be picked up by 5:30 p.m. The Extended Care option is an extra $55 per session, per student. Morning only extended care is $25 per session, per child and evening only extended care is $40 per session, per child. There is a limited enrollment of 60 students per Extended Care session. Registration deadline for Extended Care, providing space is available, is the Wednesday prior to the start of each session at noon. A charge of $10 (per child) for every five minutes late during pickup time will be charged. Students should bring a mid-morning snack and sack lunch with drink each day. Students should bring their suit and towel on Tuesdays and Thursdays for swimming. If the swimming pool is closed due to maintenance, students will participate in supervised recreation. Students selecting courses with *** must submit a school nomination form (PDF). Applications must be submitted with a school nomination from a teacher, guidance counselor, principal, gifted coordinator, or private psychologist for students applying for courses designed for gifted/talented students. It is expected that students will take responsibility for their own behavior and act appropriately to foster a positive environment for all participants. If a student should act inappropriately during the program, a warning will be given to the student and to the parents on the day of the infraction. If inappropriate behavior recurs, the child will be removed from the class and may be removed from the program. Severe or malicious infringement of the Discovery rules or policies will result in immediate dismissal from the program. A form is required for all participants who require medication during the scheduled program hours. All medications brought to the program must be given to the Coordinator. "Medications" include any prescription drugs (including aspirin or Tylenol), or vitamins. In order to protect the health and safety of all participants; please DO NOT send medications in lunch boxes or book bags. Please complete and return the medication form (PDf) to the Office of Pre-College Programs at least two weeks prior to the start of the session in which your child is participating. Our academic year office is located in 210 of the Student Union. June 1-August 3, 2019 our summer administrative office will be located on the WSU Campus at 124 Allyn Hall. Registration Deadline for Session 1 is Wednesday, May 29, 2019 at Noon. Absolutely no registrations will be accepted after this time. Absolutely no registrations will be accepted after this time. ***=GIFTED/TALENTED COURSES: Students must submit a school nomination to enroll. Students will spend the morning studying salty and fresh water creatures, how they swim, what they eat, and how they adapt to their environment. Students will spend an hour each afternoon with WSU lifeguards learning basic swim instruction in small groups. Students must bring their swimsuits and towels each day. Additional $20 lab fee applies to this course. Become the next Picasso! Experiment with art by using stamps, spray bottles, stencils, sponges, and much more. Use a variety of materials to create your own masterpieces. Become a science magician! Discover how physics and chemistry make magic. Experiment with things that glow in the dark and optical illusions. Concoct potions that change color. Learn how magicians read minds and impress your friends with coin and card tricks. Students will enjoy creating and playing math games to sharpen their skills. Card games and dice are just a few things this class will use to make math fun. Discover the world of art as you explore a different art technique each day. Learn how to papier mâché, paint, draw, sculpt, and more. Use your creativity and explore the many mediums of art. Learn about the eco-systems that exist in the canopy of the rainforest. Research your favorite rainforest creatures and discover the climate they inhabit. Explore books on the rainforest and create projects based on your findings. Have you ever wanted to make your own Web Page? Learn the basics about developing and creating your own page. Discover how to make links to cool sites, add graphics, and your own pictures. Learn the importance of safety while using the Internet. Everyone loves the games at a carnival, but did you know that science plays a role in how easily you can win? At what angle do you want to toss the ball in basket toss? What height, curve, and velocity do you need to score big in skee-ball? What level of water in bottles makes it easiest to knock them down? Create, play, and test a variety of carnival style games. Learn how to make a favorite carnival treat. Students will utilize Lego style building blocks to work through engineering challenges. How can you create a floodgate that operates? What tower design produces the most structural support? How can you problem solve with limited resources? Students will research, develop plans, build structures, and problem solve when challenging scenarios are given to them. Students have a chance to discover what a court room looks and feels like as they take on the assorted jobs. Students will participate in various “trials” to determine who is guilty and who is innocent. Court is in session! Explore the world of engineering and building. How are tunnels made to not collapse, what are the various bridges and when are they used, how do skyscrapers stand so tall? Research, discover, and build your own infrastructure in this hands-on class. Ever wonder what angle is best used when playing billiards? Is it beneficial to put a spin on a ball? Learn the strategy and physics of sports as you participate in sporting events. Plan and develop your own sporting strategies and theories. Explore advanced mathematical topics, including integers, equations, fractals, and more. Work on mind benders and logic puzzles. Use critical thinking skills to solve the mystery. Discover short cuts and ways to use logic to make sure you have the correct answer. Registration Deadline for Session 2 is Wednesday, June 5, 2019 at Noon. Absolutely no registrations will be accepted after this time. Discover how to improve your detective skills through the power of observation. Learn logic skills through playing games. Explore how detectives use fingerprints and shoe prints to help in their analysis. Read detective stories. Everyone needs to learn the basics of a computer! Learn basic keyboarding and word processing. Explore various educational games and safe sites of the Internet. Designed to introduce participants to the “fun”damentals of computing. Students will conduct hands-on experiments to study salt versus fresh water. Using common items students will create boats to float in small bodies of water. Students will spend an hour each afternoon with WSU lifeguards learning basic swim instruction in small groups. Students must bring their swimsuits and towels every day. Additional $20 lab fee applies to this course. Do you like to imagine inventions, create cool gadgets, and engineer exciting structures? Come and learn about kid creators, remake some of their inventions, and design your own. Learn what it was like to be a knight in shining armor as you journey through history and study famous castles, kings, and queens. Create your own coat of arms and build your own castle. Build a catapult and practice with different projectiles. Create your own piece of art using a catapult and painted objects. Grab your diffraction glasses and prisms for a week full of color, light, rainbows, and bubbles. Explore optical illusions and how the eye sees various colors. Make art projects exploring the mixing and blending of colors. Study the mythology behind unicorns while exploring other one horned animals. Learn how to cook a nutritious meal, write a proper thank you note, and balance a check book. Explore decision making choices and critical thinking skills. Get a heads up on important life lessons. What kitchen supplies will clean a penny? Can you squeeze an egg without it cracking? Discover the truth or untruth behind many science myths. Design investigations, choose experiments, test your theories and do data analysis. Explore the scientific method as you research and test your hypothesis. Create different projects each day! Learn about basic watercolors, chalk drawing, painting, clay, and more. Students will get a foundation in a variety of art mediums. Get a head start on Algebra. Topics will include variables, expressions, integers, solving equations, inequalities, factors, fractions, and exponents. Prepare for your next math year at school by getting your mind to think Algebra. Study, design, and create complex gadgets to perform simple tasks. Research past designs through Rube Goldberg’s cartoons and then create your own Rube Goldberg innovations. Learn the different components of a trial while developing critical thinking and persuasive speaking skills. Students will play the roles of attorneys, witnesses, judge, and jurors while engaging in this class. Get a head start on your high school foreign language requirement. Participants will learn and practice basic conversational Spanish. Explore the cultures and traditions of Spanish speaking countries. Registration Deadline for Session 3 is Wednesday, June 12, 2019 at Noon. Absolutely no registrations will be accepted after this time. 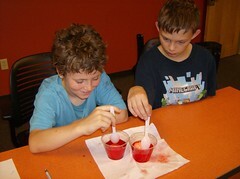 Join us as we mix, squish, and create chemical concoctions that may crackle, pop, fizz, or sometimes safely explode. Learn to love experiments early on in school. Solve math problems in fun and exciting ways. This class will cover a variety of concepts including: graphing, measuring, estimating, recognizing patterns, keeping track of time, and more. Students will spend half the day creating science experiments while learning about potential and kinetic energy. The other half will be allotted to games and activities for students to release their own kinetic energy. A great class for students with lots of energy. Put your crime scenes skills to the test when you learn about fingerprints, handwriting analysis, and more. Learn how to interview suspects and how detectives use logic and reasoning to solve mysteries. Get “wrapped up” in ancient Egypt. Learn how ancient civilizations made their mummies; explore how the pyramids were built as you create your own miniature model to take home. Write your name in hieroglyphics. Join us as we discover Egyptian mysteries. It’s great to be outdoors in the summer. Students will learn about plants, birds, and creepy-crawly things. Learn about the calls and colors of common birds. Make a bird feeder to take home. Learn the physics and chemistry behind magic as you make things appear, disappear, and levitate. Explore concepts of light, mirrors, and more. Try your hand at juggling and card tricks. Experience the world of Harry Potter as we combine literature and art to create projects and art based on the popular book series. Learn about the mythical spells, people, places, and much more. Discuss your favorite books and characters. Discover a different part of the world each day. Try different foods, play games, read stories, and create projects based on different countries. Explore unique cultures, plant life, and animals from the different locations. Explore magnetism, optical illusions, balloon science, and more as you discover the principles of physics. Participate in many hands-on experiments. Create your own experiments based on the principles of physics. Explore movie making using computers. Learn how to add interest with photos, videos, music, titles, and more. Develop a commercial. Learn how to work in groups and individually on different projects. Create a variety of desserts from healthy to decadent. Learn the science behind baking. What happens to a cake without a rising agent? Can you make an egg free cake? Experiment with no bake options, microwaved, and traditional baking methods. Are you a fan of physics? Explore Newton’s of motion through a variety of hands-on experiments. Use Newton’s second law to create a faster moving toy vehicle. Registration Deadline for Session 4 is Wednesday, June 19, 2019 at Noon. Absolutely no registrations will be accepted after this time. Have you seen Orion and the Big Dipper? Learn about the sun, stars, and the constellations. Activities will focus on math and science. Students will create their own planet mobile. Discover the world of nature. Examine trees, birds, and bugs as you explore the campus nature trails. Create your own nature journal, map, and creepy crawly crafts. What do parachutes, potato chips, and the sun have in common? All of these will be explored during this class. Can you mail a potato chip without it breaking? Can you cook with only solar power? Can you safely land a cup of water without it spilling using no lid but a parachute you design? Learn how to take on challenges that will test your logic and reasoning skills. Why are candy bars placed next to the check-out aisle? Explore how advertisements influence you. Create your own marketing campaign. Develop a budget to help you save money. Help historical figures come to life! Learn about famous people from different decades. Stand in as a wax statue of your favorite historical figure in Discovery’s very own Museum of History. Create your own costume and show off your wisdom of the past when you come to life for museum visitors! How is music and math related? Make homemade instruments throughout this class and discover how to stay on beat. Drums, guitars, and more can be made out of materials around the house. Learn how music relates to math as you explore the instruments. Who would win a fight between Superman and the Hulk? Explore the DC and Marvel Universes. Compare and contrast superheroes and their powers. Learn how to deliver a persuasive speech on who would win. Create your own superhero and develop your own illustrations. Do you love the books Charlie and the Chocolate Factory, Matilda or The BFG? Author Roald Dahl has created a cookbook making creations from his many books and movies. Put your cooking and artistic skills to the test as you create. Spend time discussing your favorite Dahl characters. Spend a week learning how to improve your computer presentation skills. Research information to create Prezis and PowerPoints. Discovery how to digitally edit photographs to enhance your presentations. Learn the importance of citing your sources. Learning a foreign language can be fun. Learn Spanish greetings, colors, numbers, and the alphabet. Games, crafts, and hands-on projects will introduce the Spanish culture. Develop a cardboard boat that will float while holding a teammate. Design an egg contraption to protect dropped eggs. Create your own invention to make life easier. Prepare to research science, use your logically thinking skills, and trial and error to invent something new. Develop your own business from choosing your product, to naming your business, designing a logo, understanding pricing and profit margins, and marketing your idea. Research trends in advertising and create a budget for success. Explore a variety of Disney movies in order to compare and contrast them to the original versions of the stories in history. Where did the story originated? Did the protagonist change from the original story? Come and see what you can concoct as we make something out of nothing using common household ingredients. Create clay, chalk, putty, and more. Take this class to learn all the basics of Microsoft Word, Publisher, and Excel. Students will learn safety tips while using the computer including how to deal with cyber bullying. Practice basic keyboarding skills as well. Have fun mixing, measuring, and munching. Learn about the food plate, vitamins, minerals, and calories. Make and eat delicious and healthy foods. Experience the world of Jack and his little sister Annie, as we combine literature and art to create projects based on the popular Magic Tree House series. Join us as we explore their adventures as they travel through space and time. Is there life on another planet? Learn science fact from science fiction when you explore the planets, creatures, and vehicles in movies and books; as you learn about the real planets, robots, and other space technology used. Learn what a real archaeologist does as you explore techniques used to dig, recover, and document artifacts. Make your own fossil impressions. Investigate to discover clues to our past. Create your own government. Negotiate with other countries and experience diplomacy at its best. Create your own flag, native crafts, and traditions. Design your country’s parliament and develop laws to make your country succeed. Learn the rules and great teamwork when you participate in uncommon sports such as: Frisbee golf, bocce ball, and others. Learn how to adapt sports so all can plan. Plan and develop your own uncommon sports. Do you want to stop your younger sibling from reading your note? Do you want to feel like a real “secret” agent by passing a coded message to your friends? This class will show you many codes and ciphers, from simple letter switching to historic code tools. Students will also learn tips and tricks of breaking many types of codes. The sky is the limit with this course. Learn about stars, planets, black holes, galaxies, and space travel. Explore the possibility of extraterrestrial life. Great comedy doesn’t just happen, it has to be crafted, and that starts with writing. Learn the basic principles of comedy, including satire and parody. Create skits, parody songs, and fake newscasts as you explore your funny side. Interested in studying about the land where manga and anime were invented? Excited to learn some basic Japanese? Explore the culture of Japan and the popularity of anime in this class. Registration Deadline for Session 6 is Wednesday, July 3, 2019 at Noon. Absolutely no registrations will be accepted after this time. Explore crystals, stalactites, bats, and more while you study caves. Make crafts, read books, and use your imagination as you discover the interesting facts about cave explorations. Explore basic rhythm patterns while playing various percussion instruments. Create your own drums out of common objects. Increase your rhythm as you are introduced to different dance moves and styles. Explore gizmos, gadgets, and ingenious inventions! Discover Leonardo and his amazing contraptions. Learn to write in “mirror writing.” Experiment with simple machines and build some of your own inventions. Do you love fluffy marshmallows? Spend the week conducting experiments using them. Estimate how many can fit in a shoe box. Predict how far you can launch one across the quad. Experiment with the density of a marshmallow to make it sink. Create a marshmallow art project and dessert. Hand-made toys have been a part of the lives of children for centuries. Make your own toy as you learn how to create toys from wood, fabric, and more. Discover the history of some of the first toys used by children. Explore outer space and become an amateur astronaut by studying planets, constellations, and the phases of the moon. Simulate discovery of a new planet and civilization. Codes, clues, riddles, and puzzles will all be a part of this crazy adventure. Using teamwork and troubleshooting, students will solve a series of challenges to unlock the “breakout” box. Students will learn the premise of the popular Escape Room challenges and create their own breakout game to use with friends. Do you like money? Would you like to know how you can earn it, keep it, manage it, and make more? Learn about checking and savings accounts, credit, investing, stocks, and more. Learn what it takes to have a budget now and in the future. Drawing, sculpting, and computer designs are all forms of art. Explore with us as we create unique works of art from these and other various art forms. Students will also be introduced to artists and artwork that relate to their own creations. Registration Deadline for Session 7 is Wednesday, July 10, 2019 at Noon. Absolutely no registrations will be accepted after this time. When you get up each morning do you check out your window to see what kind of weather we are having? In this class, students will learn about weather and what causes rain, snow, sleet, hail, and storms. Students will do hands-on experiments and create their own weather instrument. Discover the world this week through the exploration of customs and cultures from around the world. Each day explore a different continent and its location. Learn common phrases, games, and songs from across the globe. Examine the world of electromagnets as you investigate magnetic properties of various materials. Study rocks that contain magnetic properties. Investigate how magnets are used in building structures. Create your own magnetic slime. 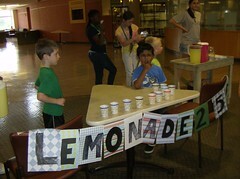 Discover a variety of math concepts as you manage your lemonade stand. Make business decisions such as pricing, quality of product, inventory, and supplies. Learn to perform various mathematical functions to make your stand successful! Have you been wanting a new furry friend or maybe you already have one? Learn about the different variety of pets available. Research the skills and training needed to properly care for a wide variety of pets. This class is not appropriate for children with allergies to animals as special appearances will be made. Join us and experience multiple art forms. Imagine yourself in Asia, Africa, Central America, or the Middle East! Make crafts from these areas as you create rain sticks, masks, and more. Explore these and other forms as art is made all around us. Learn to solve crimes by gathering evidence including fingerprints, chromatography, shoeprints, and more. Discover the importance of using good logic to help solve the crime. Practice your interviewing skills and learn what questions are important to ask. Do you love reading? Explore what makes a book great and what it takes to make it popular. From Goosebumps, to Harry Potter, to Dork Diaries, and more, discuss popular themes throughout the stories. Play games, create art, and make a favorite snack from one of the many popular books. Learn about surviving in the wilderness. Subjects covered will include: setting up a camp, making knots, map reading, signaling, and rescues. Learn to identify food and water sources. Computer programming for beginners. Scratch block programming from MIT will be used to create stories and interactive games on the computer. No prior experience needed. Just some creativity and a lot of imagination to help get you started into the world of computer science. This class is at a beginner’s level and not for those with coding expertise. Participants will learn the fundamentals of the theatre; stage directions, physical and vocal exercises, improvisation, theatre games, and much more. Students will display their dramatic side on the last day of camp. This problem-based geometry class will introduce you to fundamental geometric theories. Use logic and reasoning to connect mathematical processes for real world applications. Registration Deadline for Session 8 is Wednesday, July 17, 2019 at Noon. Absolutely no registrations will be accepted after this time. Set your compass for an adventure. Explore different trees, animals, bugs and their habitats around campus. Create art projects using natural resources you find while exploring! Discover the rhythmic side of math. See how patterns emerge in addition and subtraction. Learn to tell time and determine the patterns involved with seconds, minutes, and hours. Develop your own pattern key to help you. Curious about the life cycle of a sea turtle? Do you wonder if all sharks are aggressive? Study sea life in this class and learn how to help our oceans stay clean. Create your perfect sea animal by combining traits of different sea animals. Put your creativity and drawing skills to the test! Learn how to draw cartoon characters and caricatures. Add special effects to make your cartoon creations unique. Create your own Discovery Comics to share with others. Learn the importance of good character and leadership. Explore how one can be a good leader and a great team player through a variety of games and activities. Discover what it means to be a good sport at all times and how to work with others. Develop new skills you can use at home, school, or camp. Experience frontier life as you make candles, butter, and soap – the old fashioned way. Learn about the trip west on the Oregon Trail and design your own covered wagon. Do you want to learn methods that will help you solve problems and understand math? Topics include spatial visualization, logic problems, and geometry. Discover short cuts to math and learn how math can be fun and fantastic. Investigate airplanes, hot air balloons, kites, birds, and more. Discover the aerodynamics that allows these items to fly. Work on your own designs to build the most efficient flying contraptions. Use research and trial and error to improve your flying machines. Ever wonder what it is like to be a super star? Discover song writing, singing, choreography, dancing, and comedy! Don’t be shy, come on by and discover your hidden talents. Write your own fantastic fairy tales and develop a different ending to a familiar tale. Make crafts about the fairy tales you create and read about. Prepare to use your imagination. Students will create adventures to remember. Learn the importance of good character. Complete a variety of tasks that require cooperation and leadership. Improve on your problem solving, conflict resolution, decision making, and communication skills. Discover your leadership style. Learn about the three separate branches of government and find out what it takes to be a leader in government. Create your own government, rules, and regulations. Explore voting procedures as you elect your own leaders. Registration Deadline for Session 9 is Wednesday, July 24, 2019 at Noon. Absolutely no registrations will be accepted after this time. Have you wondered what happened to the dinosaurs of long ago? Study different dinosaurs, what they ate, where they lived, and discover how scientists have learned so much about them. Join The Cat in the Hat and other Dr. Seuss books for a fun-filled week of literature and art. Create your own Seuss-like character and write a rhyming story. Enter the wacky world of science that allows you to explore a different area of science every day. Learn about plants, animals, rocks, ocean creatures, and the human body. Do experiments and conjure up the budding “ologist” in you. Coil it, pinch it, and work it with your hands! Using self-hardening clay, you will create many unique clay objects. Express your creativity as you use beads, ribbons, and more to decorate your pottery. Discover the French culture through their food and language. Learn basic French greetings and words. Participate in games, songs, cooking, and more. Join a pirate crew and set sail for an adventure! We will recreate the world of the Golden Age of Piracy, circa 1715. Pirates will spend time each day studying biographies of their fellow pirates, constructing model ships, and identifying parts of a ship. Explore the history of Pokémon. Create your own Pokémon characters and develop their story line. Discuss the success of Pokémon and develop your own marketing plan to get even more people interested. Hands-on learning while utilizing your favorite characters. Through hands on exploration learn the history of Egypt and how it impacts us still today. Examine pyramids and build your own. Discovery hieroglyphics and write your own. Explore mummification and what purpose it served. Like to overcome a challenge? How can you overcome physics to build a tent or table out of newspaper? Using minimal resources, how can you mail a single potato chip without it breaking? Can you build a bridge that can withstand enough weight? Students will be encouraged to dream, design, build, and test in this class. Are you ready to move out already? Discover what will help you when it is time. Learn basic skills of cooking, laundry, job etiquette, money management, and more. Get a heads up on important life lessons. Have you ever felt strongly about a controversial issue but felt unable to state your point? Improve your public speaking and your ability to analyze data while preparing for various debates. Learn debate etiquette and how to research both sides of a topic. Participate in multiple debates throughout the week. 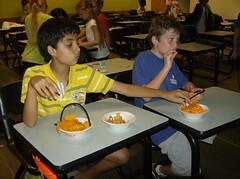 Experiment with molecules, heat, crystals, acids, and bases. Identify the properties of these substances while learning the fundamentals of chemistry.